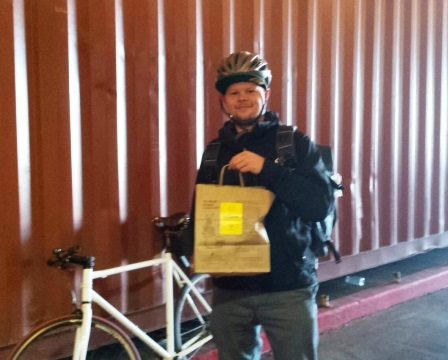 Chipotle vs Xoco lunch delivery: Who won? WBEZ's Monica Eng gets a delivery from Xoco through Uber Eats. Chicago cubicle dwellers who dig sustainable Mexican food got great news recently. Both Chipotle and Xoco now have services that will deliver a fresh lunch to your downtown office faster than you can say barbacoa. Chipotle is using a service called Postmates and Xoco is using Uber. Postmates already delivered food from a bunch of other Chicago restaurants, but late last week Chipotle announced it was joining forces with them. Meanwhile, Uber launched a new feature called Uber Eats in Chicago and New York (after piloting it in Los Angeles). This week we tried out both and here’s how it went. 1:19 p.m. I’m hungry for some Chipotle guacamole so I google Postmates. 1:26 I successfully figure out their menu system (they have multiple restaurants and pretty complete menus), register for Postmates, enter my credit card information and request two orders of guacamole. 1:27 I get a message that Postmates has found a driver who will be here in about 28 minutes. I contact him to say that we are located in the middle of Navy Pier near the entrance for Chicago Shakespeare Theatre. 1:55 I see on my computer screen that the bike delivery will be here in 2 minutes. 1:58 I am met by a friendly guy on a bike who hands me my bag of guacamole and chips, lets me take picture of him and he rides off. 10:58 a.m. I get my Uber app ready so I can be the first to order in the 11 a.m. to 1 p.m. daily window. 11:00 I can’t get Uber Eats to work on my phone from WBEZ in the middle of Navy Pier*. I can see the menu and order but can’t find a driver. 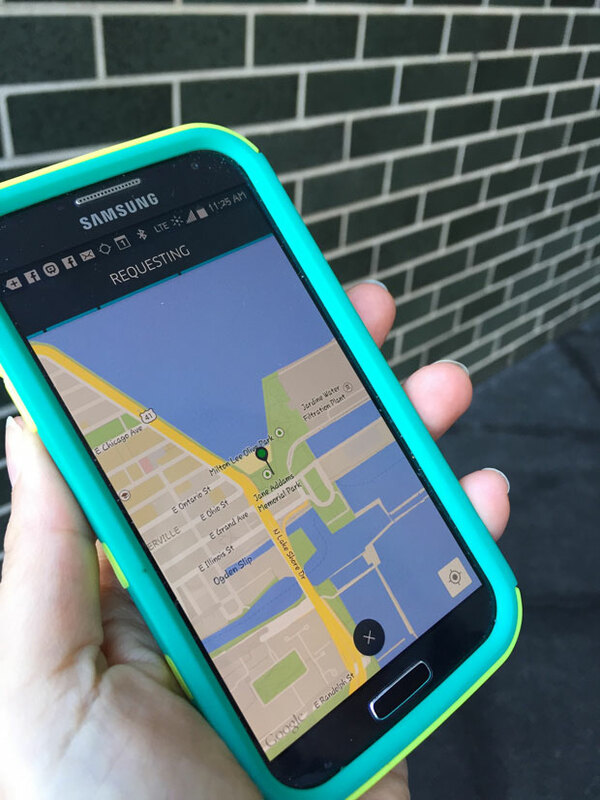 *Tuesday afternoon Uber clarified with us that currently the app is not supposed to work East of Lake Shore Drive. 11:10 I walk west down Navy Pier and the Uber Eats icon has disappeared from my phone. 11:25 I get out to Lake Point Towers and the Uber Eats icon returns to my phone. I order but it won’t find a driver. 11:30 I walk to Lake Shore Drive and Grand Avenue and the app starts to work. I click on the menu button, order both menu items of the day: a Pepito Torta ($12) and XOCO Salad ($9). I’m told a driver will arrive in 5 minutes. 11:38 The driver arrives, hands me a hot sandwich and cold salad — no bag — and I trot back to the office, thaw out and eat. While the Postmates delivery was wildly expensive, I did like that it was delivered by bike (although not always the case), that you can choose from several unique restaurants (think Cemitas Puebla, Le Colonial and Wow Bao) and that you can do it on a computer and keep track of your order history. Uber Eats folks told me that the app should work at the end of Navy Pier, but I was not able to get it to work until another two blocks west. While Uber Eat’s daily menu is limited to only two items a day, they have some great choices coming up from XOCO, DMK, Freshii and Cemitas. And while their geographic area is limited to River North and the Loop, Uber representatives say they hope to expand it in the future. For adventurous budget diners who work in the Loop or River North and can’t get away from their desk sometimes, Uber Eats wins for speed and price. For out-of-Loop workers who have more cash, time and need for variety, Postmates may be the best choice.